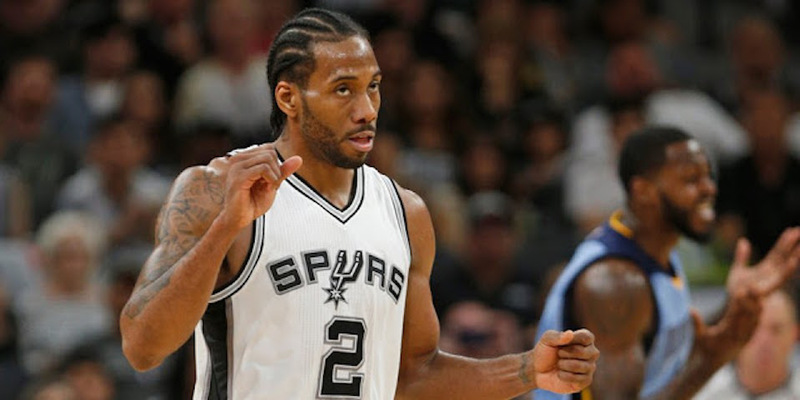 Kawhi Leonard made it clear that he wants to be traded away from the San Antonio Spurs, and few teams have as many trade assets to acquire him than the Boston Celtics. Boston has many different ways of acquiring Leonard, from trading away a star player to letting go of a package of future picks. Here are a few possible trade options to send Leonard to Boston. This trade proposal is a clean swap of star players, with the Celtics getting Leonard and the Spurs getting Irving. This trade makes sense for the Celtics if they feel that Leonard is more likely to return to the team than Irving after this season. However, if the team is uncertain of either player’s future, it seems that this trade isn’t a major improvement over what the team was last season. Overall, the Celtics should make this trade if they feel Leonard will re-sign and can extend their championship window. Otherwise, a package of younger players could be better for the “win now” Celtics. This trade sees the two teams swap max-contract wings and backup-level point guards in a swap of relatively comparable talent. The Spurs get an all-star to stay relevant and a point guard for the future, while the Celtics get a top player in the league and a solid guard with a bad contract in Patty Mills. This trade appears to make the Celtics marginally better this season but also gambles on the future of the championship window. With Leonard set to become a free agent and the bad contract of Mills, this trade works best for Boston if they can confirm that Leonard will re-sign. The other downside to this trade is the fact that they would be trading away Hayward before he even played one full quarter for the team, and likely impact their chances with future free agents. Overall, this trade makes the team marginally better this season but could affect the team down the road. With this trade, the Celtics get Leonard and Mills while giving up a 32-year-old Al Horford, rising star Jaylen Brown and a couple potentially top picks. For the Celtics, this move would keep them as a contender this season but put a dent in their ability to get young players through the draft in the future. San Antonio would make this trade if they wanted to remain relevant while rebuilding for the future. They would take on Horford’s large contract as his career likely comes to a close as they stockpile picks in order to rebuild the franchise with young players. Overall, this trade appears to allow the Celtics to get a top player in the league while giving up only a few future picks. Unfortunately, they also have to give up two of their own top players to make the trade financially work, but it could be worth it to get a top player in the NBA. This swap will occur if San Antonio goes all-in on rebuilding for the future and the Celtics go all-in on winning now. The main pieces heading to the Spurs in this trade are Brown and the three first-round picks. Brown is already a rising star, while the Kings pick is likely to be a top pick next year, and the 2021 pick could also be important, as that could be the first year that high school players are allowed to enter the NBA Draft. Morris also proved to be a solid starter during last year’s playoffs and could be a good fit for the Spurs. Boston wouldn’t be giving up any bonafide stars in return for Leonard. Rather, they would be giving up one young player on the rise, a few solid role players, and a slew of future picks in order to commit fully to winning championships now. Overall, this trade gives Boston the best chance to win now, while giving San Antonio the best chance to fully undergo a rebuilding process with a top young player in Brown and plenty of top draft picks. Both teams would have to commit fully to the cause, and while that doesn’t seem likely, this trade could wind up working for both franchises at different points. These trades all logistically work, and whichever direction the Celtics would like to go will likely determine which offer they send over to San Antonio—if they send one at all. It’s never easy to trade for a top player in the league, but Danny Ainge did it last year for Kyrie Irving, and he could, with all of these assets, just as easily do the same this summer.